Meher Spiritual Center was established by Meher Baba as a spiritual retreat for rest, meditation, and renewal of the spiritual life. 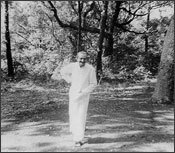 Meher Baba blessed the Center with his presence on three occasions in the 1950s, calling it his home in the West. The Center is open year-round for retreats of up to two weeks, and for day visits, by all who are sincerely interested in Meher Baba. 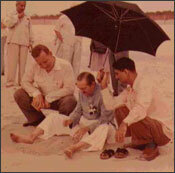 At the Center's beach, 1956. Eruch holds the umbrella while Lud Dimpfl looks on. Five hundred acres of dense forest adjacent to the Atlantic ocean and two fresh-water lakes provide a peaceful natural setting. Situated throughout the retreat are residential cabins for overnight visitors, kitchen facilities, and numerous walking trails. Buildings used by Meher Baba during his three visits in 1952, 1956, and 1958, offer settings for individuals to visit for quiet reflection, and are preserved as much as possible as they were during his visits. There is a library and a meeting place, where a variety of written and audio-visual materials and programs offer many opportunities for learning more about Meher Baba and his message of love and truth.